Steven S. Deknight brings audiences another dose of giant robot on giant monster action in Pacific Rim: Uprising. 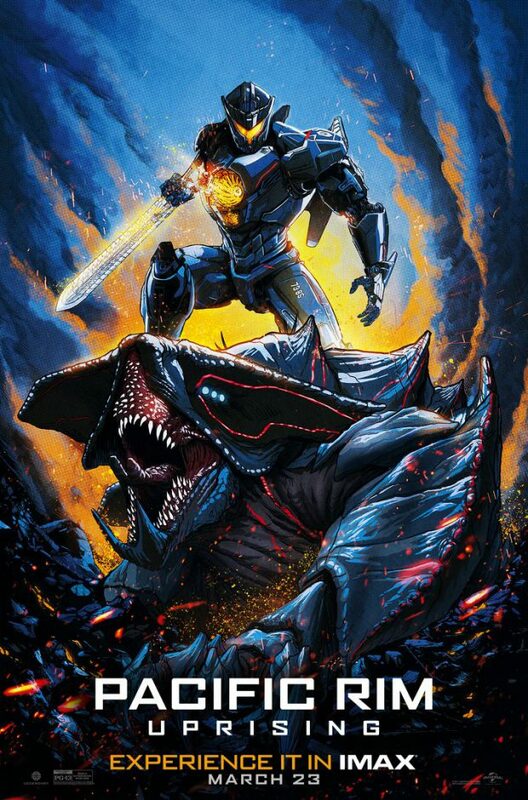 The first Pacific Rim is a divisive film in that many people love it and many others hate it. I’m firmly on the side of those that love it and recently appeared on a podcast devoted to declaring undying love for it. A sequel to it is something I both wanted and didn’t want as the first film was a fairly self contained story that didn’t require one though I was eager to see more especially if Guillermo Del Toro was to return. Sadly he didn’t and Steven S. Deknight was given the job of directing the follow up and the immediate question is: “Did he do a good job?”. The answer to that is complicated but on the whole the film is a really good time; it’s well paced, the characters are engaging enough, the action is great and there are a lot of good ideas floating around that expand the scope of the universe. In short there’s nothing outwardly wrong with it and yet it lacks something that the first film had. The first film was intricately crafted to tell a story that is built around the characters with a well thought out original universe surrounding them. The giant machines had weight, the monsters were distinct and the overall style of the film was incredibly attractive. This film lacks the sense of identity to let it stand out from other modern blockbusters by inviting comparisons to any large scale property damage ridden summer movie. I was constantly reminded of Michael Bay’s Transformers movies in both plot details and the execution of certain things. Certain aspects of it could be compared to Independence Day: Resurgence though not in any way that causes the film to fall apart. Despite not managing to stand out by having something that could be uniquely attributed to it the film does have a lot going for it. John Boyega’s Jake Pentecost is the son of Idris Elba’s Stacker Pentecost from the first film and serves as the protagonist. John Boyega is wonderfully charismatic and carries the film with ease. Jake is a good character who has something of an arc that takes from from aimlessness to filled with heroic purpose. The progression feels like it’s missing something in the middle but Boyega’s natural charm allows him to pull it off. Scott Eastwood’s Nate Lambert is another ace pilot who has a complicated history with Jake that the film isn’t all that interested in exploring beyond having their dislike for one another be a barrier to them working together. The actors are strong enough to make their rivalry believable but it doesn’t seem to be founded in anything and it disappears with no real resolution to it. Eastwood is really good in the role, looking and sounding more like his father than ever which gives him a grizzled standoffish presence that lets him come across as the authority figure the story requires. Cailee Spaeny’s Amara Namani is a teenager from the wrong side of the tracks who proves to be incredibly intelligent and resourceful making her very useful to the film’s story. Spaeny is engaging and sympathetic with a tortured backstory that the film spends some time on. She’s a great foil for Boyega and her character has the most defined arc of anyone though still falls somewhat by the wayside. Having her lead a group of teenage cadets with her brash attitude works well enough for the requirements of the story. Tian Jing’s tech genius Liwen Shao is used well for the most part. She comes across as brilliant yet arrogant with enough humility to make her useful to the overall plot at key moments. In many ways the film revolves around her to a point before becoming caught up in something else so her importance is clear. Tian Jing bounces off the rest of the cast really well and has some really good moments throughout. Some cast members from the first film return such as Burn Gorman’s Dr. Hermann Gottlieb who has an expanded role as the scientist who provides the answers whenever they’re required. Charlie Day returns as Dr. Newton Gieszler in a key role that becomes crucial to not only the film but the franchise as a whole should it continue. Rinko Kikuchi returns as Mako Mori but her role is little more than a cameo and does a disservice to the character so should probably have been left out entirely. I’ve mentioned repeatedly that character stories are largely forgotten about as the film progresses. One of the major issues with the film is the fact that there’s just too much going on for such a lean running time. Over the years I’ve read various interviews with Guillermo Del Toro where he suggested sequel ideas that were varied because he had so many of them. It’s almost as if someone involved in the production of this follow up decided to throw as many of those ideas in as possible but had no real idea how to make them work together or progress them to a natural conclusion. The end result is a patchwork of different ideas that largely don’t fit together in a coherent way. With a bit more work these ideas would have had a lot of potential and if the film focused on one or two of them while crafting coherent character arcs then it would have been more satisfying from a storytelling point of view. Ticking everything off the list in a single film means that they can’t be used in a sequel though perhaps part of the thinking was that a sequel seems unlikely. All of that sounds really negative and it is but for me none of that got in the way of my enjoyment. I liked the characters enough to be invested in them when they were put in danger, found that the plot never slowed down enough to become boring and was really entertained by the action sequences as ridiculous as they were. 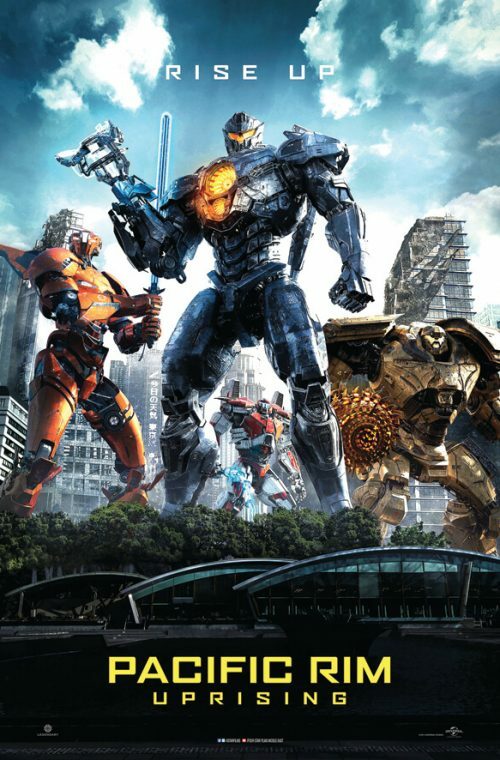 Guillermo Del Toro’s focus on how the machines move to emphasise the less than graceful man made touch has all but been forgotten and the climax has property damage to rival Man of Steel but the end result is a finely crafted display of cinematic spectacle designed to dazzle the viewer with an onslaught of sensory input so that the obvious problems feel unimportant by comparison. It’s refreshing to see a blockbuster that doesn’t make any apologies for how loud and ridiculous it is because its primary purpose is to entertain. It’s not a patch on the first film and will likely be forgotten fairly quickly but it’s entertaining while it lasts. An entertaining follow up that does very little wrong but doesn’t come close to matching up to its predecessor. One of the major issues is that there are too many ideas thrown into the plot of the film to allow any of them to be developed properly. The end result is dropped character arcs and underdeveloped plot points that could have sustained a film on their own. The actors do a good job all around with John Boyega and Cailee Spaeny standing out above the rest and the film does enough to mean that it’s possible to invest in most of them when their lives are in danger. The action is impressive to look at even if it is ridiculous and the film never slows down long enough to become boring. It’s refreshing to see a blockbuster that makes no apologies for what it’s trying to be even if it will be forgotten fairly quickly it’s still entertaining while it lasts.